Did you know that they celebrate King’s day in The Netherlands? It’s the birthday of their King. 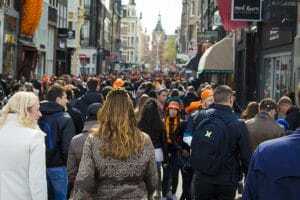 For one day in the year all the Dutch people go out on the streets to celebrate. This will be a nice opportunity for you to mingle in. Join the Dutchies in their celebration spirit! King’s day in The Netherlands is on April 27th. It’s a public holiday in The Netherlands. Almost nobody is working, most of the people are partying. The day starts early in the morning with a second hand market. Everybody that has something to sell can sell stuff on the streets. Especially in the early morning it’s fun to walk around. You’ll notice a lot of children selling! You can go to the Vondelpark to check this out yourself. Be sure to set your alarm at six o’clock in the morning. Then you’ll have the best experience possible! The earlier the better. After the market you can wander around in the city. You’ll see a lot of people and hear a lot of music. Especially in the city center! You can go to a street party and watch the Dutch celebrate. You won’t be dissapointed holding a Heineken beer in your hand. As the colour orange is the national color, wear something orange that day. Eventhough the color is not in the flag of the Dutch, this color is important. You’ll see everybody wearing something orange. A hat, T-shirt or necklace, you name it. You can start celebrating King’s day already the night before. There will be a lot of parties around the city. This is called King’s night and it’s a big thing! They know how to throw their parties. Almost all clubs are throwing one. If you want to go there, look in advance if you need tickets. Some parties are sold out way before King’s night. Check it out so you won’t be dissapointed. When visiting Amsterdam, be sure to book a nice hostel for yourself. Hostel Amsterdam Leidscheplein offers you a comfortable place to stay at an affordable rate.